When the New York Times calls something “the iPod of” (fill in the blank), it’s probably worth looking into. In this case, it’s only worth investigating if you have a feline companion… and if you do, ModKat’s got something for you. 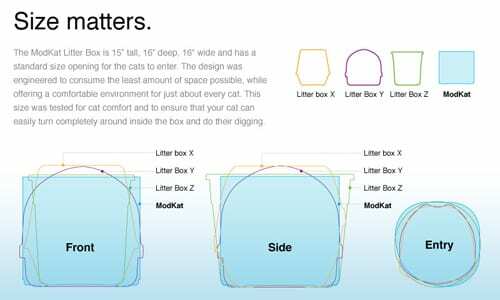 The ModKat litter box takes the most basic of pet essentials and turns it on its ear with a sleek modern design and color palette. The enclosed base and “rooftop access” mask the visual and… er, aromatic… nuisance of the traditional litterbox, and the design keeps your furry little monster from tracking litter onto your floor as it makes its exit. Available in white, black, red, yellow and blue, it’s not only friendly to the eye; it’s also friendly to the environment, with a reusable tarpaulin liner that’s easily washable and totally hidden. 16″ x 15″ x 15″. $180.